What if your driver could accurately service his route using just his tablet or mobile phone? Say hello to Stock by Parlevel – a free mobile vending app to increase the efficiency of vending, micro market, and office coffee / dropoff operations. 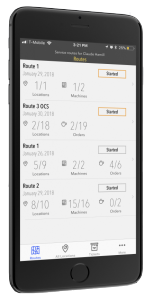 Stock lets your drivers view their daily routes, service machines, adjust inventory, create service tickets, and much more – all from the convenience of their mobile device. Vending is an on-the-go business, and your management system should be too. Parlevel’s vending management system (VMS) uses remote machine monitoring to see what is happening in your machine at all times. 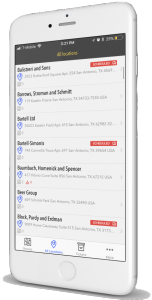 Machine inventory, product sales, breakdowns and more are automatically sent to your management system. From here, you can better plan routes, streamline your inventories, and better merchandise your machines. With these tools and more at your disposal, you can spend less, sell more, and optimize your operations. Stock is a micro market, office coffee, and vending app for your mobile phone that ties into Parlevel’s VMS, but is optimized for mobile operations. Stock is specifically made for drivers in mind – the app helps them service their routes more efficiently and faster than ever. No more jotting notes on paper, changing inventory without recording it, or simply tossing away damaged product. Everything your driver does on their route is guided and recorded by Stock. You can monitor your drivers and keep them accountable. Plus, instead of purchasing expensive handhelds to service machines in the field, you can let your drivers use Stock on their existing mobile phones or tablets – saving thousands of dollars in the process. For example, once you plan your routes for the day using Parlevel’s VMS, your driver’s route will seamlessly sync to his phone. He can view each stop for the day on his own mobile device and know exactly what products he is stocking. Plus, the app will calculate the fastest route to take to each location. Once he finishes servicing a machine, you’ll know immediately, so you can track his route progress as it happens. If there is something wrong with the machine, he can immediately create a service ticket from the Stock vending app – and your technician will know about it immediately. Expired, damaged, or refunded products can be recorded on Stock and immediately synced up to your VMS. This helps you stay in the know and start gaining control of your operation. These features and many more help you follow along with your driver, enhance your service, and take control of your operation with Stock. Stock is currently available on iOS and coming soon to Android.